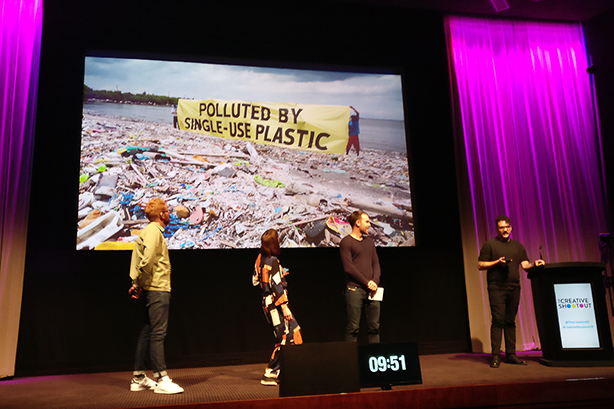 Wire has won the 2019 Creative Shootout after delivering a clever pitch to help drive public awareness and compel companies to adopt A Plastic Planet's Free Trust Mark. Wire's winning pitch for the Creative Shootout in London. The agency held off stiff competition from runner up Ready 10, while 3 Monkeys Zeno and Talker Tailor Trouble Maker came in joint third. Wire, a Scottish marketing and PR agency, came up with a clever campaign that aims to makes plastic packaging a public health issue. It is a little known fact that 93 per cent of people contain plastic inside their bodies due to planet-choking amounts of the substance used in society. Wire's campaign, which was conceived in only four hours before presenting, would involve heath trucks providing free public tests underpinned by a PR campaign on why plastic packaging is killing society. Ready 10’s effort involved a catchy campaign to remove packaging from fresh produce like fruit and veg. Why dress your groceries in extra plastic clothes, the campaign argued, when it is healthier and cheaper for your strawbery to go naked. Talker Tailor was on the receiving end of trouble, for a change, when their slide deck went amok. Boss Steve Strickland and his team recovered brilliantly to showcase a campaign where the Free Plastic kitemark could piggy back off Comic Relief’s Red Nose Day. Meanwhile, 3 Monkeys Zeno’s pitch revolved around a Free Plastic loyalty card that offers consumers reward points for buying products that don’t contain plastic packaging. There were eight agencies pitching in the final, each given ten nerve-wracking minutes to rid the world of plastic. All well as those filling the podium spots, competitors also included 72 Point, Brands2Life, Fever, Raw London and Stein IAS. "The Creative Shootout is the most real and raw creative show and award in the UK," Creative Shootout founder Johnny Pitt said. "Not only does it showcase creative talent, but it also does some serious good in a world where creativity needs to come together more. A Plastic Planet is in good hands with Wire." Sian Sutherland, co-founder of A Plastic Planet, added: "What a night, and Wire’s campaign will make a massive difference to us in 2019 as we aim to have international brands and businesses applying for our Plastic Free Consumer Trust Mark to help empower the public to buy plastic-free – ie guilt-free." Judges for the event were Creative Equals CEO Ali Hanan, Taylor Herring co-founder James herring, A Plastic Planet co founder Frederike Magnussen, Leo Burnett chief creative officer Chaka Sobhani, Sutherland and Pitt.